The ViA Agent - our CEO's meeting the merchants and the users our customers. TRUST and TRUST will make us a global sucsess Building and cultivate the social network at the spot, in your naighbur around where you live and know your people. 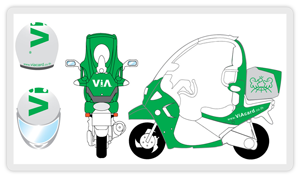 ViA is devloping a compleet ViA Agent standrad, including safe motorbikes, or may we say, motorbikes with better safety. First Line of defence The most important person in the ViA organistration and within the ViA Business Model is the ViA Agent.